MUSLIM IMMIGRATION or MUSLIM INVASION? - When we consider the great efforts Pope Francis is making to protect immigrants coming from North Africa to Italy, no one can be insensitive to the aspect of charity it represents. Indeed, throughout History the Church has always defended, protected and assisted as much as she could the poor, the immigrant and even the criminal. We have, for example, the proverbial case of a criminal being chased by the police who would manage to touch just an external pillar or wall of a Church building. This simple gesture would have the magic effect of halting the police chase and making it futile with regard to that criminal. Why? Because, no civil authority was allowed to enter the Church’s buildings and territories, and the gesture of someone touching a wall of a Church building was symbolically considered that he was inside her property and, thus, had her protection. According to Church law, a criminal must be given the possibility of conversion before just punishment was meted out. Thus, the Church would welcome the criminal and try to lead him to a good path. If she did not succeed, she would deliver him back to the temporal justice. By the way, it was due to this centuries old privilege that Luther found his “religious vocation.” In the aftermath of a forbidden duel in which he killed the contender, Luther was being physically chased by the police when he reached that Augustine Monastery in Erkfurt and was received inside its walls. He was saved momentarily from the police, but since they continued to watch the bandit to catch him should he sneak out, he resolved to stay. This is why he became a monk. How much better for the world if those policemen would have been faster in their pursuit! The Church has always been merciful to immigrants, there is no news here. However, sometimes it has happened that this goodness served as a duplicitous pretext to favor the conquest of a territory by enemies. This was the case of Oppas, Archbishop of Seville, who connived with the Arabs in the early 8th century to facilitate their invasion of Spain. (1) So, we must be cautious to verify whether it is the rule of charity that is actually being applied or a deceitful action favoring another invasion of Muslims. 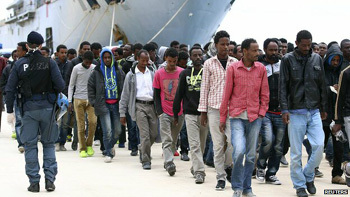 When we evaluate the situation of present day Western Europe with about 30 million Muslims, (2) most of them immigrants, with Italy alone having more than 1.6 million of these, the question of “showing charity” toward the Muslim immigrants has to be reconsidered carefully. I am not addressing here the problem of the loss of identity of Europe and Italy, which is obvious. I am writing about a virtual invasion, which leaves Europe and Italy at the mercy of the Muslim muftis, who at their convenience can command an open rebellion of all Muslims and put Europe into a state of chaos, such as occurred in France in 2005 and in parts of Italy in 2010. I am a daily reader of the L’Osservatore Romano (OR), the newspaper of the Holy See, which spares neither tears nor favors for those immigrants. 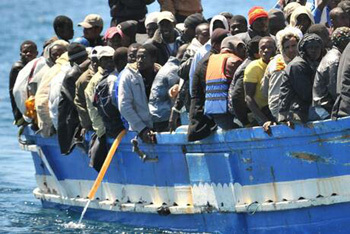 There is not one single boat of Muslim immigrants that suffers an injury that OR does not report and lament. No women, children or elderly. 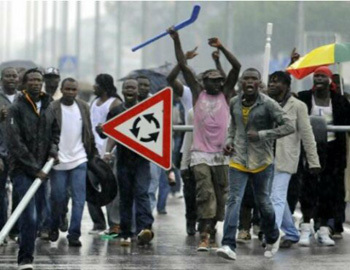 Is this immigration or invasion? 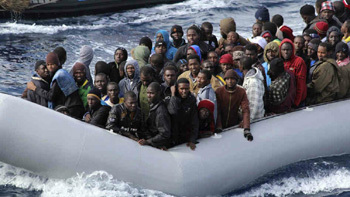 When I consider the photos of boats brimming over with immigrants coming from Africa to Italy, I see that they do not correspond to the normal pictures of families fleeing from an oppressed country, that is, boatloads of men, women, children as well as some elderly dear to the family. Typical refugee boats were commonly seen, for example, when Communism took over South Vietnam. Now, the boats coming from North Africa to Italy are almost all filled with men – adults and youth – ready to enter the urban guerilla strife. These are the same type of people who burned and destroyed properties in Calabria in 2010, harassing the civil population and threatening to spread chaos. So, my question is whether Pope Francis and the Catholic Church in Italy are repeating the same treachery worked by Archbishop Oppas many centuries earlier, which is to bring over and support the Muslim forces that will take over the country and implant a Caliphate in it, as they announced they would do in Europe, similar to what they did in Spain in the 8th century. 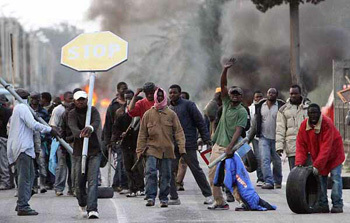 In order to offer my readers means to ascertain the objectivity of my statement, I invite them to look at photos showing the type of immigrants coming in boatloads to Italy - photos at the left side in this article - and compare them to those of the 2010 riots in Calabria - photos at the right side. Then, let them note how similar in age, strength and general appearance those who are inciting the riots are to the present day immigrants. The reader may find more on the role of Archbishop Oppas in my booklet The Return of the Muslim Threat (Los Angeles: TIA, 2002) pp. 13-21. In 2010 the estimated Muslim population of Western Europe was 25,966,000; the same population in Italy in 2010 was 1,583,000; see source here.